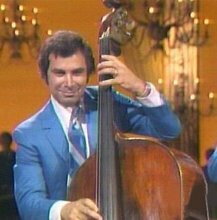 Richard Maloof played bass and tuba on the Lawrence Welk Show from 1967 to 1982. Maloof was born in Sacramento. After attending Sacramento State University, Maloof played with with Les Brown and later Carmen Cavallaro. It was during his stint in NORAD when he got the invitation to join Lawrence Welk and his Music Makers, replacing the the ever popular Tuba player, Buddy Hayes. Maloof remained with the Lawrence Welk Show until 1982. In Addition to Lawrence Welk, Maloof also performed in several TV shows such as "The Julie Andrews Show," and "Kojak," as well as numerous commercials and feature films. Maloof also did six years with the Los Angeles Pops and also teaches music sight and ear training for LA's Musicians Institute. Today, he lives in Sherman Oaks with Mary Lou Metzger, married to since June 1973.